The answer depends entirely on your set up and how you want your modulation, reverb and delay pedals to sound. However, if you’ve never tried your effects loop, now is a good time to try and you’ll be surprised at the difference it makes. What an effects loop (or FX loop) is. How to connect your pedals to the effects loop. The difference an effects loop makes to your guitar sound. What is a guitar amp effects loop? A guitar tube amp effects loop is an input and output section between the preamp stage and power amp section in your amplifier. It normally appears on your amp as the send and return. What this means is that you can use the preamp – which is where your amp gets its tone and voice from – in your actual signal chain with your pedals. This is called preamp distortion. This is particularly important for players that use their amp for distortion sounds but still want clear delay and reverb sounds from their pedals. The difference between an effects loop and going into the front of an amp. Often you’ll hear the term ‘the perfect pedal platform amp’. What this means is that the amp has loads of clean headroom so that the pedals can give your guitar sound the voice. The amp itself won’t compress or saturate until much higher volumes which means it’s a platform for you to use all of your wonderful, juicy guitar pedals! Normally, with a ‘pedal platform’ amp like a Fender Hot Rod Deluxe, you’ll simply have all of your guitar pedals in a certain order going into the front of the amp. You’ll use pedals for distortion and because of how you set up your board, you’ll probably have Modulation > Delay > Reverb a bit later in the signal chain. Some amps don’t even have an effects loop and this is generally because they are pedal platform amps. These amps are generally single channel and won’t have distortion on-board. But what do you do if you use your amp for distortion and not pedals? This is where an effects loop comes in because it means you can still use your drive and boost and compression pedals into the front like you normally would, but you can put your Modulation > Delay > Reverb into the effects loop which puts them after the preamp. And remember the preamp is the part of the amp that is giving you that saturated distortion sound anyway? So essentially, an effects loop gives you the ability to use your amp distortion in the right place in your signal chain. It’s worth noting that whilst these are all suggestions, there is absolutely no right or wrong way to wire your pedal board and the best guitar pedal order for your pedalboard is merely a guideline. What’s the best guitar pedal order for a pedalboard? Guitar > Tuner > Boost > Overdrive >Distortion > Fuzz > Modulation (like Chorus/Flanger/Phaser etc.) > Delay > Reverb > Clean Channel on guitar amp. If you did the same thing with an effects loop because you want to use the amp for distortion, it would look like this. Guitar > Tuner > Boost > Overdrive > Distortion > Fuzz > Front of amp. 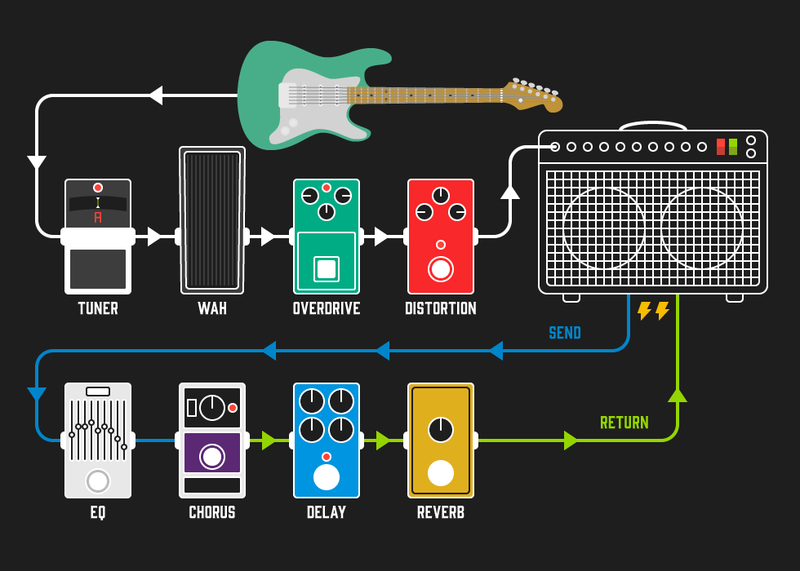 What’s the best guitar pedal order for your effects loop? Effects loop send > Modulation (like Chorus/Flanger/Phaser etc.) > Delay > Reverb > Effects loop return. I’d suggest some experimentation, especially with the order of your modulation pedals in the effects loop as there aren’t really any hard and fast rules. Should I use overdrive or distortion in the effects loop? I don’t suggest using any boost, overdrive or distortion pedals in the effects loop as these will boost the gain and the signal and could cause damage to your guitar amp by overloading the power amp. Tread with caution as you could end up breaking your amp completely. Should I put Delay or Reverb first in the effects loop? Generally speaking, delay comes first and then reverb. That way the delay repeats will also be covered in that lovely reverb but still be clear enough to be heard. The other way around will mean that the delay repeats your reverberated sound. This could create a cool effect but certainly not the most versatile. So, to answer the question, should I use an effects loop? You use the distortion on your amp if you want your delays and reverbs to be clearer than ever whilst using a distorted amp. You use a pedal platform amp and you aren’t precious about having muddy delay, modulation and reverb – it’s all part of the sonic texture anyway right?